LOL Andy! You’re kidding me? Oranges were thought to be poisonous? I’m trying to imagine the conversation that happened just before the very first person took the plunge and tried one. . .
LOL! And that’s why I love you Andy! LOL Andy! If it didn’t happen that way it should have! I’m trying to comment from my phone which I find frustrating which is weird because it’s orange. Everything is really good Lizzie! I hope everything is good with you too! A veritable melange of good rhymes. Aha! A Melange!! What a great word to go with orange! An Orange Melange. That would make a great character name, wouldn’t it? How about Detective Orange Melange? My kid told me this joke the other day. This can only mean one thing, Guap. You, my friend, are my child. Waitaminute – who exactly will be chopping off whos hand here? LOL! Oh Guap! You have a god-given talent for balancing out the universe in a crooked way just right! I admire anyone Linda who attempts to rhyme orange. Must be a terrrible life for orange to know the best poetic effort of all time will be your very valiant effort. Well done. LOL! Our poor dear orange! But still, one has to admire it’s ability to hold it’s own in the color crayon box. All the while keeping a stiff upper tip. So true Linda, never intimidated is it. A true individual. Wow! It’s like my brain, Peanuts, has a long lost twin! The rhyming of orange is a delightful way to draw Trent into a conversation. And Linda your rhyming is way better that mine! Aw. You’re nice! But I think we are both in contention for the Orange/Splorange award. There is one isn’t there? Tis true. There must be one… There is one for everything else! Just between you and me, I’m working on the Orange/Splorange Award in my lab and it should be done shortly (I’m still waiting on the nuclear waste). LOL – now that is funny! I hear they of lots of it in parts of Nevada. And up in Southeastern Washington where I’m from too. What a splendidly orangey ode. It’s orangelous! Orange you nice! Thank you! I think Pete Townshend is a brilliant lyricist. He doesn’t do the usual rhyme scheme; he’s more inventive than that; he comes up with a word or words that have the same tone or feel to them. So, I’d betcha that Pete could find a word or phrase that worked. As it stands, you’ve done about the best that we mere mortals can do. Ah! Shucks. I’m blushing orange from your kind words about my orange poem, Donald! And I know who Pete Townshend is, but I’ve never read any of his lyrics. Now you’ve got me curious — I’ll have to google him. Oh, you are remembering the name, but I guarantee you already know “who” he is. The writer/guitarist for The Who. Orange IS the new Galore-ing! But it is yesterday’s door hinge. I can tell you had a fabulous time in Mexico. 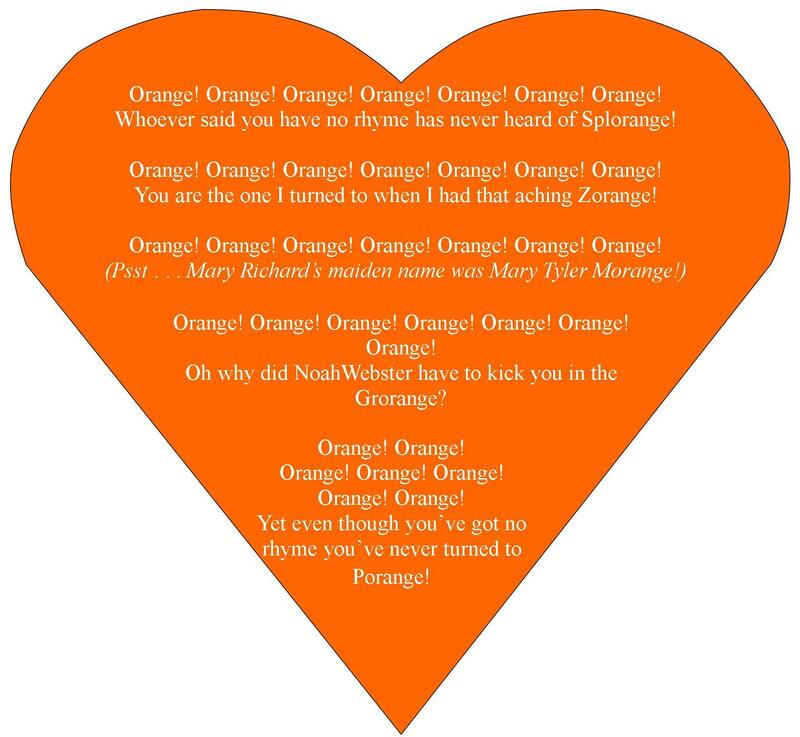 An orange heart!!! This will alter civilization as we know it!! Every Valentine card will have to be scrapped and reprinted with the true color of love– Orange!! Ahah! I knew there was a reason you turned out to be the way you are. Any household that encourages their children to eat their fish sticks as a show of solidarity to the penguin community AND whose main topic of conversation is that nothing rhymes with orange is my kind of household! I’ve never felt closer to you than I do right now, Markie MacGiggles! Which explains the warm glow I’m feeling right now.